Application:indoor garden, pot plants, garden, seeding, breeding, farmland, spray plant, greenhouse plants, pipeline cultivation, flowering, etc. Environmental friendly, low heat, no infrared ray or ultraviolet radiation. High quality and long service life, can light up to 30,000hrs. Very helpful to the growth of plants, flowers, vegetables, etc. Indoor led plant grow light, perfect for greenhouse plants, plant enthusiasts, plant breeders, etc. * Blue(wavelength: 400nm~520nm): Help plants grow. * Red(wavelength: 610nm~720nm): Help plants sprout and flowering, and it is the key for flowering plants. * IR(wavelength: 730nm): IR can help plants grow. * UV(wavelength: 380nm): UV can help plants grow and kill insects. Attention:We can customize LED light for you based upon your request. 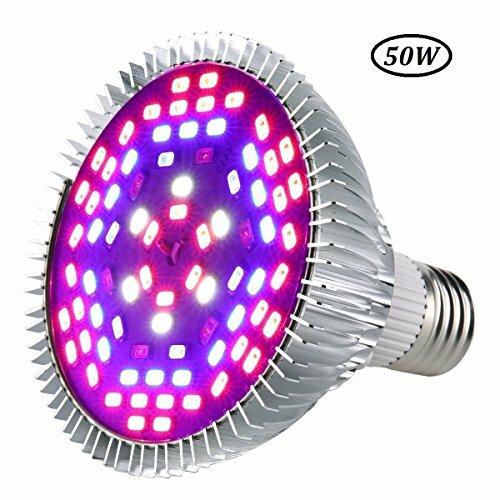  78PCS Full Spectrum High-efficiency Epistar 5730SMD LED chips:42 Red +18 Blue + 6 IR + 6 UV + 6 White; Plant light can provides the most efficient wavelengths of light to enhance photosynthesis performance hence improving plants' healthy growing.  When In the greenhouse or plant laboratory, it can completely replace the natural light and promote plants' growth. Whether at dusk or night, it can effectively extend and scientifically control the requiring lights of plants.  Made of metal aluminum radiator shell, excellent heat dissipation and greatly extend its service life, you can always keep the temperature at the appropriate level, effective for plant growth and protection.  Save Energy: 50W equivalent actual power consumption of about 20W, saving your electricity bills, environmental protection, as lights is fully absorbed by plants. E26 screw base, fits all E26 or E27 Edison Socket.  Multi-purpose: Widely used in greenhouse and indoor plants, flowers, hydroponic systems and vegetable cultivation, corn, in the darkness, rainy, snowy day and winter, to provide plant with additional sunlight, support photosynthesis. If you have any questions about this product by Esbaybulbs, contact us by completing and submitting the form below. If you are looking for a specif part number, please include it with your message.